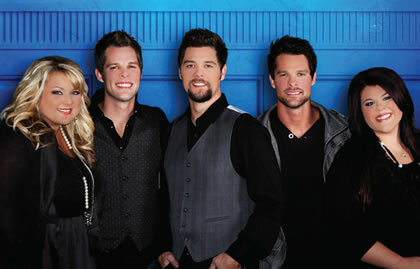 When THE CRABB FAMILY disbanded in 2007 to pursue solo ministries, it felt as though there was a collective sigh of disappointment from Southern Gospel fans who loved the talented siblings and their unique sound. Well, those fans now have reason to rejoice as the family reunites on TOGETHER AGAIN, a new album set to release in February. Together Again reunites Jason with twins Adam and Aaron, sister Kelly Crabb Bowling and sister Terah Crabb Penhollow. The group rose from humble roots in Beaver Dam, Ky., to become one of the most popular acts in gospel music, winning 11 Dove Awards and earning three Grammy nominations. The Crabbs announced they were parting ways in 2006 and performed their last show together in 2007, splintering to form individual ministries. These days Aaron and his wife, Amanda, are worship leaders at Pastor John Hagee’s Cornerstone Church in San Antonio, Texas. Kelly and Terah perform with Kelly’s husband Mike as the Bowling Family. Adam also continues to record and tour. 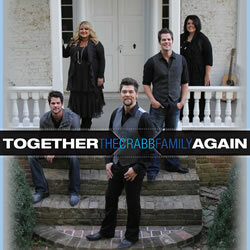 Together Again is a perfect blend of the signature Crabb Family sound that made the young vocalists one of the most successful groups in Southern Gospel, along with some fresh touches that signal an exciting new chapter. And as a result of the experience gleaned from their separate ministries, there’s a newfound depth and maturity. In looking for songs to record, they turned to some of the industry’s best-known writers, among them Neil Thrasher, who cowrote Jason’s solo hit “Somebody Like Me,” and of course, Crabb Family patriarch and Dove Award-winning songwriter Gerald Crabb, who contributes “God’s Got a Plan.” “If there’s anything that’s straight-up Crabb Family that you would hear in the day, that’s the song that we went back to and did like what you’d hear if we had cut another record,” Jason says of the tune Gerald penned with Don Poythress. Kelly cites the first single, “If There Ever Was a Time,” as another of her favorites. “This song takes me back to my childhood when I would hear people stand up in church and say how much they needed the Lord to be there and to hear and answer their prayers,” she says of the song which was written by acclaimed songwriter Sue Smith. For more articles about the Crabb Family, click here.